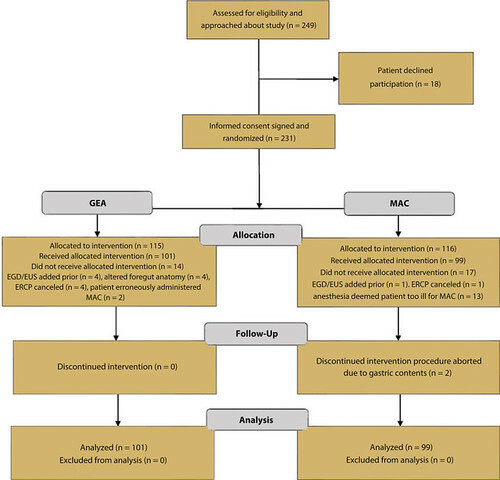 GIE Associate Editor, Dr. Sharmila Anandasabapath, highlights this article from the April issue “A randomized controlled trial evaluating general endotracheal anesthesia versus monitored anesthesia care and the incidence of sedation-related adverse events during ERCP in high-risk patients” by Zachary L. Smith, DO, et al. This is one of the few studies which compare, via a randomized controlled trial, general endotracheal anesthesia to MAC (propofol) in patients undergoing ERCP. In the current climate, which relentlessly pushes for unit efficiency and turnover (in both the procedure room and recovery area), there is a great need for articles which directly evaluate sedation options. The current approach is highly dependent on the unit and the individual anesthesiologist. Thus a body of literature is needed to provide guidance for different sedation options. The concept that GEA reduces efficiency may need to be questioned given the frequency of interruptions related to airway compromise during ERCP with MAC. Figure 1. Study flowchart. MAC, Monitored anesthesia care; GEA, general endotracheal anesthesia.